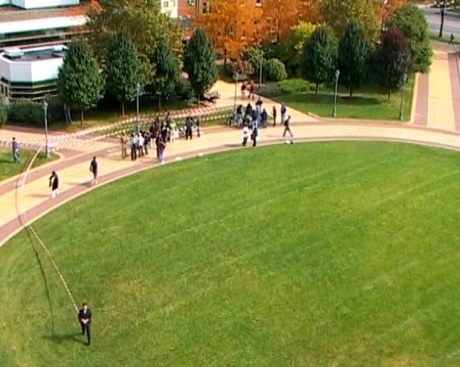 Here, a man appears on the prestigious oval lawn in front of the library, where students walk by to go to classes. 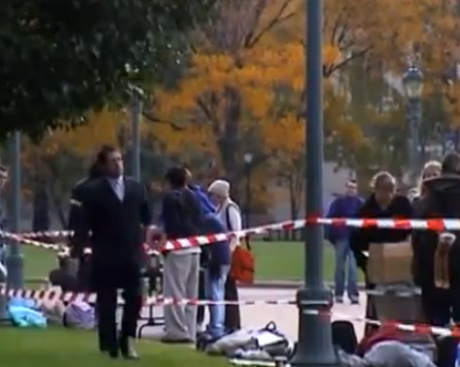 A normal day on an American campus. The tiny figure walking the middle of the path opposite the high viewing point, strikes as slightly out of place: the gap is put in place, visually. It is also put in place in the performance, as he walks faster than others, as if he had a purpose. 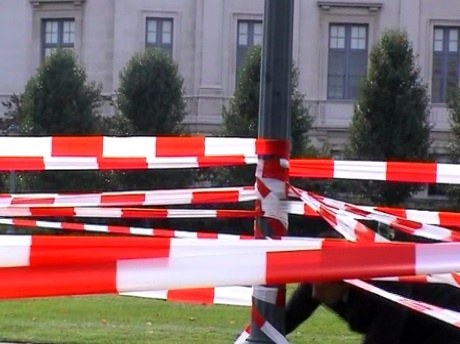 He begins to unroll red-and-white European caution tape, routinely used to block of areas that represent a danger for the public. He knots the end of that tape to a tree. With fierce determination – or is it resigned repetition? – he screens off an area. 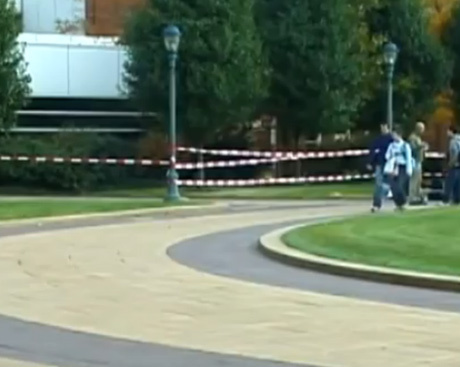 First, between trees, so as to block off the busiest path that leads to the center of campus. Repetition, constituting a dense sculptural wall of bright colors, establishes the hallmark of the series as video installation. 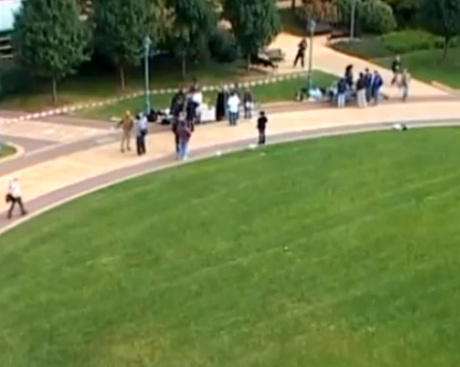 Then, he begins a somewhat longer walk over the lawn to the other side of the oval. He attached the tape to a tree there, then returns. Color, sculpture, and performance vie for attention as the kick-off media, measured against video’s power to make surface stick on the retina. Some of the images ask how it is that space can get overruled by intervention. 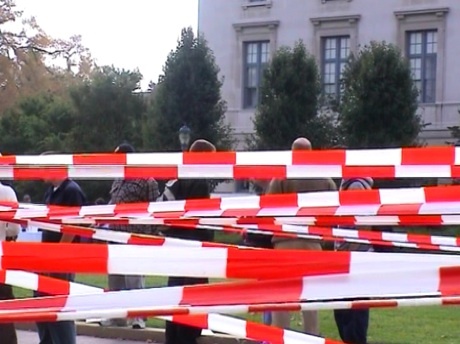 When the people behind the tape lose their visibility, or their faces, for example, one can wonder how abstract art – here, blocks of bright red and clear white – takes over figuration as if it had always been lodged at the latter’s heart. Or, whether the walking man is the sculpture or the tape waving in the wind. One wonders, too, about the blandness of the public space before, and its new look after the intervention. You can order a DVD with all 4 elements of GAPS (Road Movie, The Alcazar, Caution and Rockefeller Boulevard) for 12 euro. please add 8 euro for shipping. To acquire a DVD, you make a donation to my current film project. 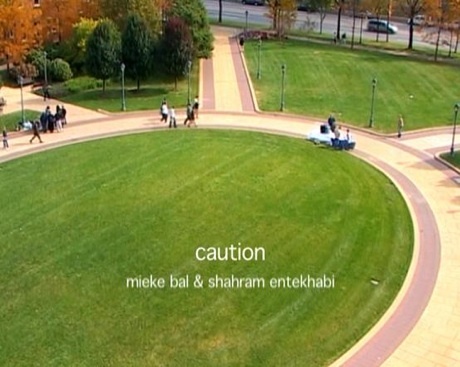 You then send an e-mail to Mieke.G.Bal@gmail.com with your address you wish the DVD to be sent. Please also include the details of your transfer (bank account no., name and date of transfer).